October | 2012 | Arthur in the Garden. 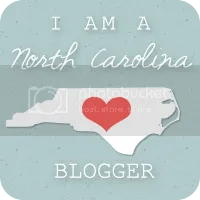 For the love of Wired Wednesday! 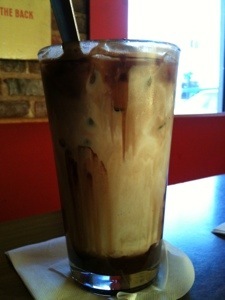 Nothing I love more on Wednesday than the Wired Wednesday iced double mocha lattes at Cup A Joe on Hillsborough Street near NCSU in Raleigh, NC. They really get me going to make it until Friday! You know I love Indian food. The spicy, earthy flavors are wonderful! Cumin, curry powder, and turmeric all add an earthy, spicyness to Indian food. I decided to try to make samosas at home. A samosa is a fried or baked pastry filled with a savory filling. 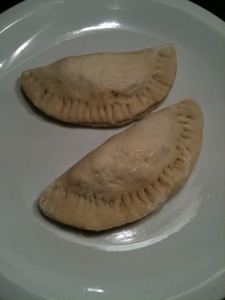 Sometimes they are called hand pies, dumplings , or turnovers. Just depends where and who is making them. 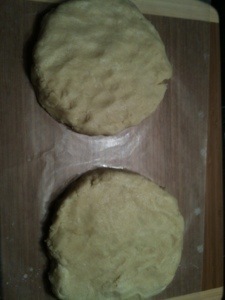 1) While olive oil is heating you can make the dough. 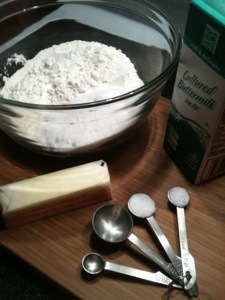 Mix the butter, flour, salt, and baking soda. 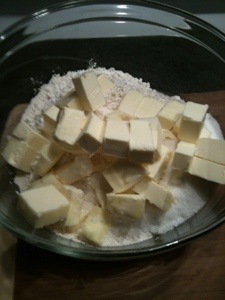 2) Cut the butter into small cubes. 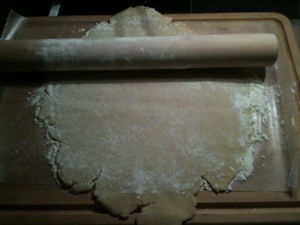 Incorporate the flour and butter until it forms a lumpy dough. 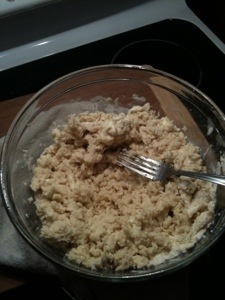 I added a tablespoon of buttermilk because everything taste better with a little buttermilk! 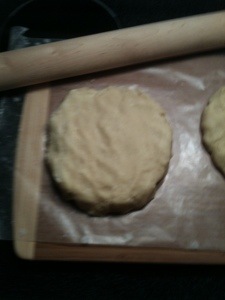 3) cut the dough in half and form into a disk. Return to the refrigerator to chill. 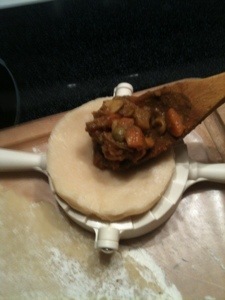 4) The onions should be soft now so you can at the vegetables. 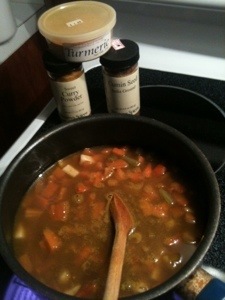 I cheated and used two cans of mixed vegetables in addition to a tablespoon each of cumin, turmeric, and curry powder. Cook for about 10 or 15 minutes and then turn the heat off. 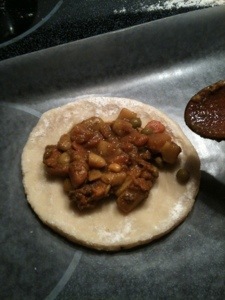 5) Remove the dough from the refrigerator. 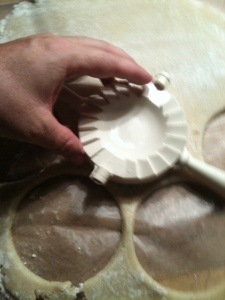 6) Roll the disk out to about a quarter inch thickness. 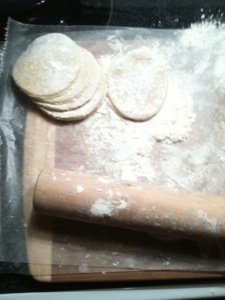 7) Use the back of the dumpling maker to cut the dough out. 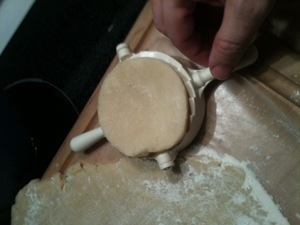 8) Place the cut out dough in the front side of the dumpling maker and press in the center to make a pocket. 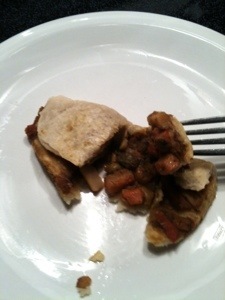 Place a teaspoon of filling in the pocket. 9) Folder the dumpling maker to close and seal the samosa. I had a problem with the crease cracking when I folded the maker over so I decided to make the remainder of them using the old fashioned cookie cutter. This produced a nicer shape and then I folded and crimped them by hand. 10) Bake them for about 15 minutes at 350f. You could fry them, too, for crunchy skin but I hate frying anything! The filling was perfect but the dough was very soft and moist. It fell apart easily and was very sweet. Next time I think I will use less butter! But it’s a beginning of a good recipe. Why gloves are your best friend when working with Trifoliate Orange. Tools help a gardener succeed. Most of us don’t treat our tools with respect. I often leave them out on the patio. They rust. I rarely sharpen or oil them. I am not the Martha Stewart of tool maintainance. I don’t like wearing gloves because I get a better feel of what I am doing with my hands. Unfortunately, I forget that I should use them with plants that have thorns or sharp leaves. I was reminded of this when I was removing Carolina Jasmine from a Trifoliate Orange the other day. 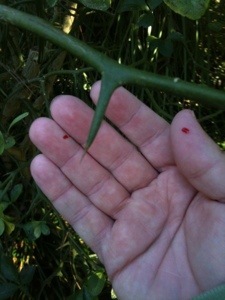 Several large thorns pierced my hands several times while I was trying to untangle and remove the vines. It drew plenty of blood! Its also time to begin feeding the birds again. The migratory birds will be passing through all Fall. Its a great time for birdwatching these rare visitors. 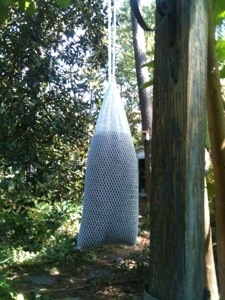 I placed several Niger Seed feeders around the yard. 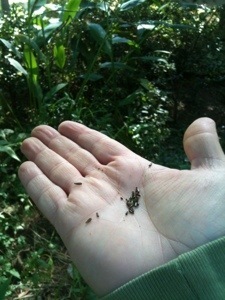 You can purchase sock feeders filled with this small black seed that birds love. I also have wire feeders that I keep filled with black sunflower seeds all year. Northern Cardinals love them! Small birds love the Niger seed and will flock to these socks. They usually empty them with in a few days. They are inexpensive and easy to use. The small seed is more expensive than other seed and dries out quickly so only purchase what you will use or the amount the birds will eat within a week. Once it dries out most birds will not eat it.